Digital track gauge DTG has been developed for track and turnouts geometry measurement. The DTG track gauge is lightweight, has a very big measurement groove width range, which makes blades alignment easier, and moreover, it is equipped with the state-of-the-art electronic system with the backlit graphical display, legible even in the direct sunlight. The DTG gauge is available for all track gauge values. The DTG is easy to use, accurate, lightweight, reliable, rain and frost resistant. The DTG graphical display screenshots shown above represent the measurement results of track and turnout, measurement options selection, and logging of the infrastructure events and defects. Information shown on the control box display may be stored in the keyboard memory, and later transferred to the PC. 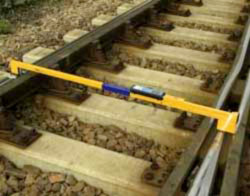 The track gauge may carry out the track and turnout measurements, and can be used for registering the results of the visual inspection of infrastructure elements. The DTG track gauge is lightweight and easy to use. The software delivered with the gauge makes it possible to archive the readings and to print out the measurement reports; it is also possible to export the measurement data to text files and spreadsheets. Device is insulated, ready to work immediately after switching on.